If you are a small gardener with a productive crop of peas, the Mr Pea Sheller will make a fantastic addition to your kitchen gadgets. With its easy-to-use design, this pea sheller will save you hours of labor shelling peas. Using the built-in clamp, simply attach this device to a table to have it ready for each new batch of peas your garden produces. Available at an incredibly affordable price, a Mr Pea Sheller should be in every home gardener’s kitchen. The unit itself is very safe to use and can be easily operated by one person. After securing it to a sturdy table, feed one pea at a time through the nylon mesh rollers. Turn the crank and the fresh peas will be separated from their pods and collected in a pan. If turning the hand crank is too burdensome, you also have the option of attaching a standard electric hand mixer to turn the device. With the electric mixer in place, just steady the pea sheller with one hand and feed peas with the other. Harvesting your fresh peas is fun and easy with the addition of a quality pea sheller. When you discover how easy your MR Pea Sheller is to use in your kitchen, it will become as indispensable as your blender. Order yours today and say goodbye to hand shelling forever. With 394,667 acres devoted to peas farming, North Dakota leads the nation in the production of field peas, or “dried peas”. More than half of the field peas grown in the United States are grown in North Dakota, with the remainder of peas farming concentrated in Montana, Washington, Idaho and California. The cool temperatures in North Dakota are just fine for the field pea. In fact, the country that produces the most field peas in the world is Russia. Field peas are sold as dried peas for humans as well as feed for livestock. Due to their high protein content and easily digestible nutrients, dried peas are a healthy staple in the diet of both humans and animals. Watching a pea harvest in North Dakota is a lot different than the harvest of your fresh garden peas. Instead of picking each pea one by one when they are fresh, a giant tractor harvests them after they have dried. 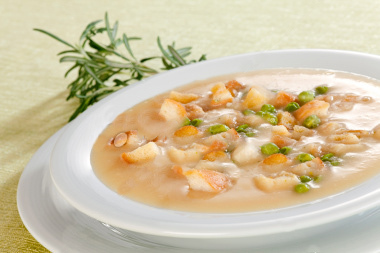 When thinking of my favorite recipes, pea and ham soup immediately comes to mind. The delicious soup can be the perfect light lunch, or can make for a fantastic side dish of first course at dinnertime. Peas are an exceptionally healthy addition to meal, adding protein and fiber to the meal. Chef Keith Snow has created a video demonstration of how to properly prepare a pea and ham soup recipe from start to finish. He starts by cutting up a carrot and white onion, cutting them up and then sweating them out a bit in olive oil, adding a bit of salt and pepper. He used some leftover ham from an Easter meal, adding the ham and the peas to the onion carrot mixture and then topping it off with some organic chicken broth. After adding the broth, he adds dried oregano into the mix, and then fills a tea bag with fresh thyme, adding that to the soup (he’ll remove it later on). In the ham and pea soup recipe, Snow suggests bringing the soup to a boil, and then bringing it to a media heat and allowing it to cook for 40 minutes. After 40 minutes, the soup should be ready to enjoy! Peas are not only a delicious vegetable; they’re also a nutritious one. Grown around the world, peas can be an excellent addition to any meal as a side dish, or a wonderful snack to enjoy. There are a number of different varieties of peas out there ranging from sweet peas to snow peas, all peas share some of the same nutritional benefits, making them a healthy choice as well as a delicious one. Let’s take a look at some of peas benefits. In comparison to other beans, peas are relatively low in calories. The beans are a good source of protein and soluble and insoluble fiber, while keeping the calorie count low. 100g of peas have only 81 calories, making them the perfect light addition to most any meal. Peas have a number of benefits on the vitamin front. A 100g serving of peas includes 21% of your average daily requirement for vitamin K. Vitamin K is known to help bone mass building and helps promote osteo-tropic activity in bones. The vitamin is also known to be exceptionally helpful with Alzheimer’s patients, and reportedly limits the neuronal damage that happens in brain with people who have the disease. Chances are you’re used to getting your vitamin C from fruits like oranges. A single serving of peas, however, also includes 67% of your recommended daily allowance of vitamin C/ascorbic acid. The vitamin has a number of benefits, but most commonly is used to help build up the body’s ability to fight infectious diseases. 25.5% of your recommended daily allowance of vitamin A is found in a single serving of peas. Vitamin A plays a role in maintaining the health of your mucus membranes such as your skin and eyes. The vitamin is also thought to help prevent some types of cancer, specifically caner that occurs in oral cavities and lungs. Peas are a great source of folic acid. Often taken by expectant mothers as a supplement, folic acid helps prevent neural tube defects in pregnancies and keep unborn babies safe. While the folic acid is definitely a benefit, the other vitamin content as well as the protein benefits make peas a great food for expectant mothers to enjoy, allowing them and their baby to get a number of benefits in a single meal without having to consume a ton of calories in the process. Whether you’re enjoying peas as a side dish or snack, or including them in a larger dish such as a chicken pot pie or salad, peas have a number of fabulous health benefits. If you’re not already eating peas regularly in your diet, the vegetable is well worth a look for inclusion into your next meal!